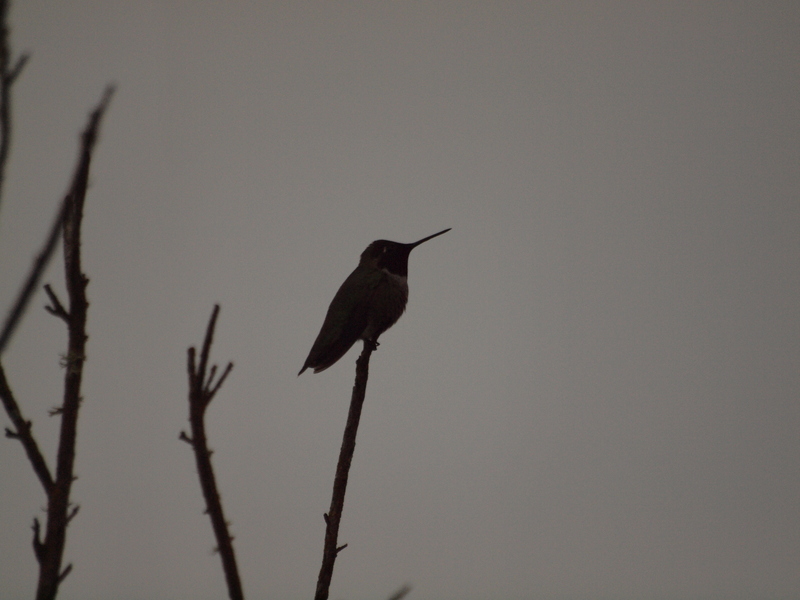 2012 in review; much more to come to SlowBirding in 2013! Currents of shore birds lifted above the Brazoria National Wildlife marshes on a cold February day. 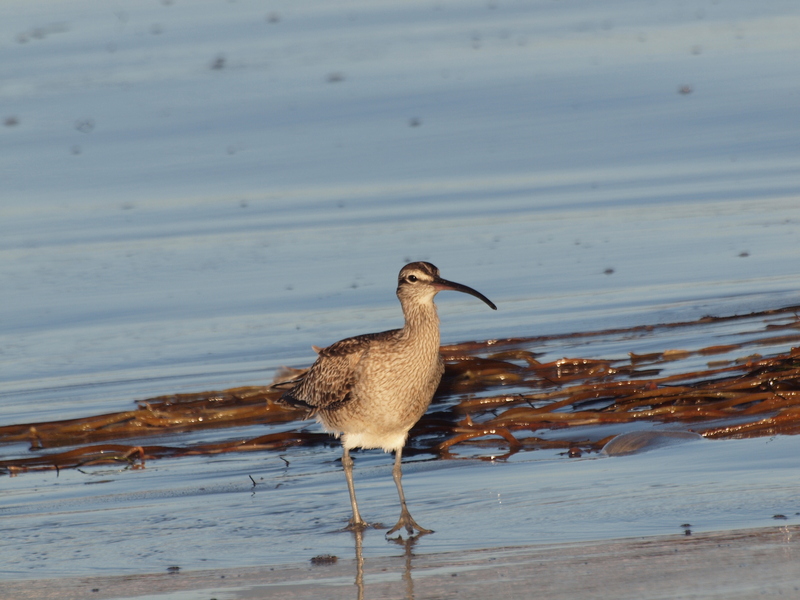 Thousands of sandpipers, dowitchers, yellowlegs, stilts, and ducks fled the hunting bald eagle. A blue-winged teal flew across the marsh, now high, then low, with the eagle in pursuit. This one teal had become the target and was fleeing for its life. It was likely to succeed because it was fighting for its life, while the eagle was simply fighting for its dinner, as Richard Dawkins put it so clearly in The Blind Watchmaker. The other reason the teal was likely to live was that this was a second year eagle, mottled white on its breast. It was clearly still learning when to give up the chase and move on. I wouldn’t exactly say it was toying with this duck, or that one, as it coursed across the marsh, but the eagle didn’t seem to be too serious either. I looked over at our students, standing on the low dike bordering the marsh. They were cold, for a couple of hoodies were about as much as they could imagine. They huddled in two groups, slightly separated, but tight within the groups, sheltering from the wind. All 11 pairs of binoculars were pointed skyward. Most of them had never seen a wild eagle, let alone one that might catch a duck. I hoped I was witnessing an important event in their lives, one that would be told tonight back in their Rice University colleges, Wiess, Sid, Baker, or Jones, and again in other years, perhaps whenever they visited a marsh, or sat around a campfire. This is one of the joys of teaching, being there when the spark begins. Eagles hunting ducks cannot be scripted the way the quiz we were about to give can be. I suppose we need the quizzes, for we need to generate a little focus, but I’ll take the hunting eagle any day. I’ve seen many eagles over the years. I’ve seen them sitting in the trees along the Yampa River near Steamboat Springs. I’ve seen them flying low over Pilant lake at Brazos Bend State Park. 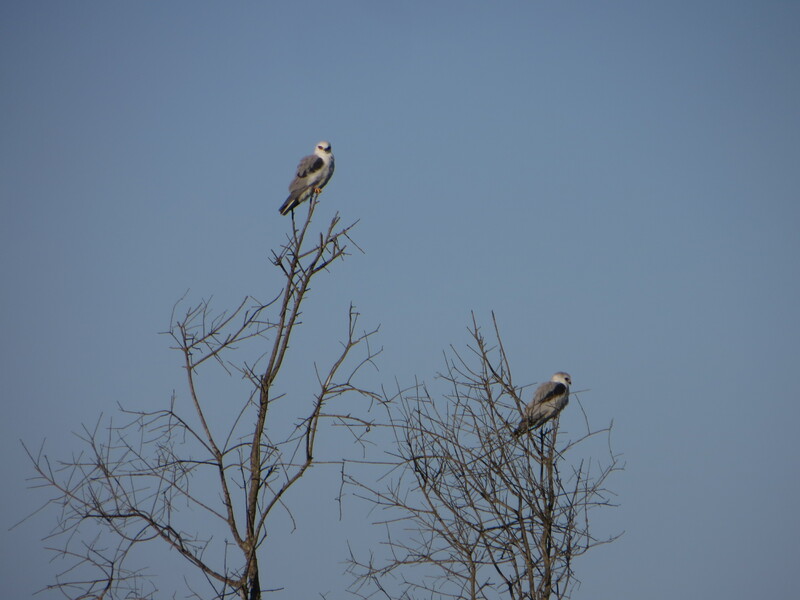 Two weeks ago we saw two bald eagles in trees overlooking the Mississippi river, near Alton, on the Illinois side. Last week, in February 2012, three years after the Brazoria eagle, I saw 4 eagles, all second year, from the Missouri River Runner Amtrak train bringing me home to St. Louis from Kansas City, where I had been to give a talk at Avila University. But enough about rivers and their motionless eagles. What is known about hunting eagles? Bald eagles, scientifically known as Haliaeetus leucocephalus, in the Accipitridae, are meat eaters who are happy with carrion, but also catch their prey. 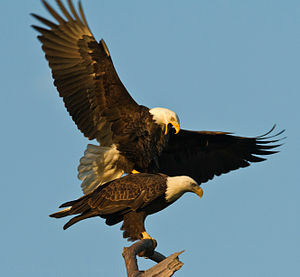 Joseph Buchanan and James Watson (2010) watched bald eagles in Oregon and Washington. They found that eagles could catch their prey on the wing. They also found that eagles could predict exactly where a duck would surface, and swoop down to catch it just in that moment of interface between water and air. They saw western grebes and buffleheads meet their end in this way at Eld Inlet, off Puget sound, in Washington. 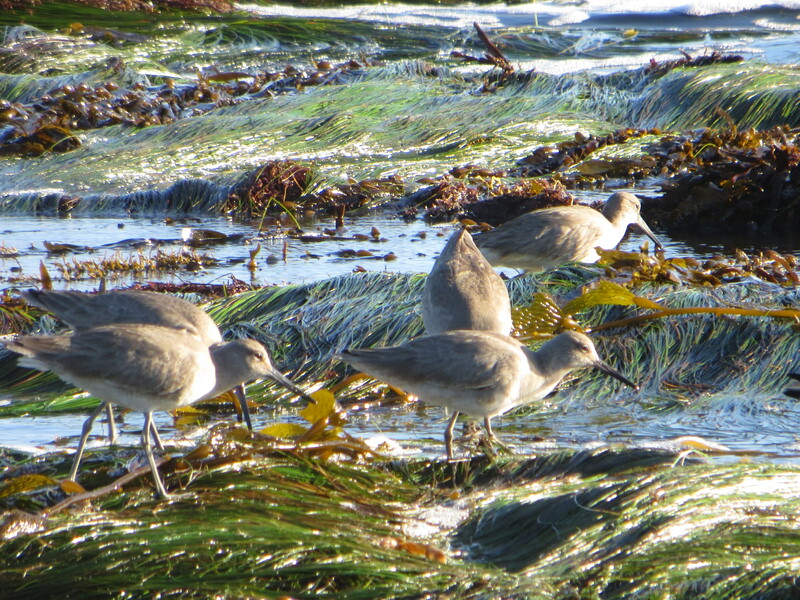 They also reported a clumsy kind of cooperative free-for-all as mostly immature eagles hunted herring gulls. I can’t imagine gull would be a meat of choice, but they were abundant at the study site. The description is detailed. Here is a piece of it: “At 08:31 the 2 Bald Eagles abruptly discontinued their pursuit of the gull and began to attack another Herring Gull. Two other sub-adult Bald Eagles joined the attack almost immediately. 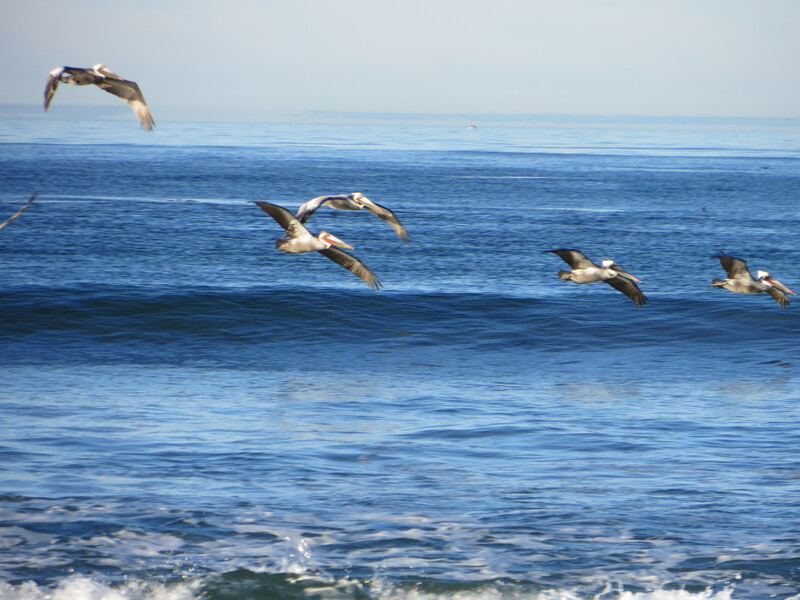 The chase began at 30 to 50 m above water, the height at which most of the gulls were soaring. The eagles made at least 40 approaches of the gull until 08:34 when the gull dropped down to fly within about 10 m of the water, where the eagles made at least 40 more approaches.” The story goes on, ending with the eagles giving up, though other attacks were apparently successful. Adult gulls flee hunting eagles successfully, but in some places the eagles find gulls that cannot leave so easily. Glaucous-winged gulls nest in groups in Barkley Sound, British Columbia. 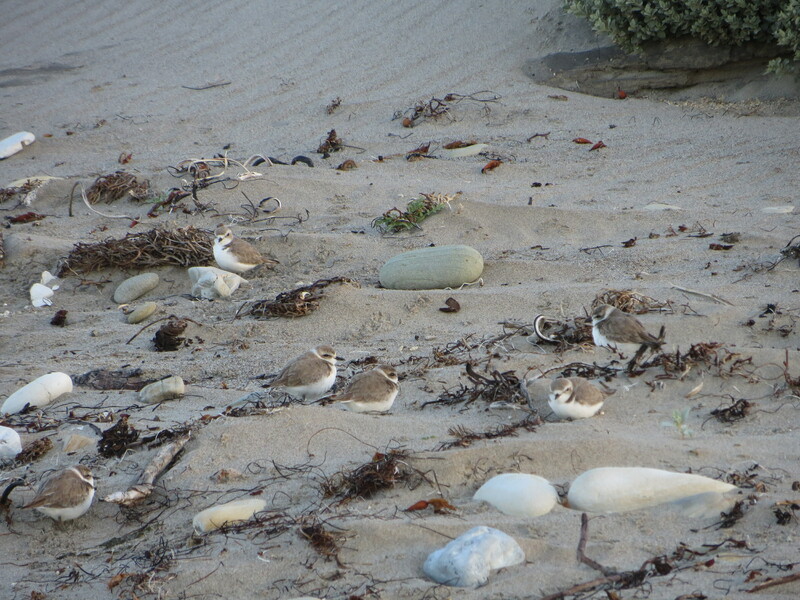 There, White, Heath, and Gisborne found indirect evidence that they preyed on chicks, and forced the gulls to put more time into vigilance, time taken away from foraging for the chicks. Indirect evidence means they did not see an eagle taking a chick or egg. What they did see was eagles hanging around the colony, something that peaked in late June, with about 4 eagles seen per visit to the 45 gull colony. The gulls were more likely to take flight when eagles were around and more of the gulls were vigilant, looking around, presumably for eagles and other predators. The investigators found that 89% of the gull nests were empty by 6 July 2005, though they could not rule out the impact of a storm. This study is highly suggestive that eagles are bad news for nesting gulls, but it cannot rule out other causes of the gull behavior. The eagles peaked when the chicks were young, so the increased vigilance behavior could be because of the eagles or it could be a correlate of something else. This happens commonly in science, and we must be careful to understand exactly what we know and what we do not know. This study indicates the researchers are onto something that warrants further study, not something completely understood. Eagles eat a lot of other things, from fish to carrion. 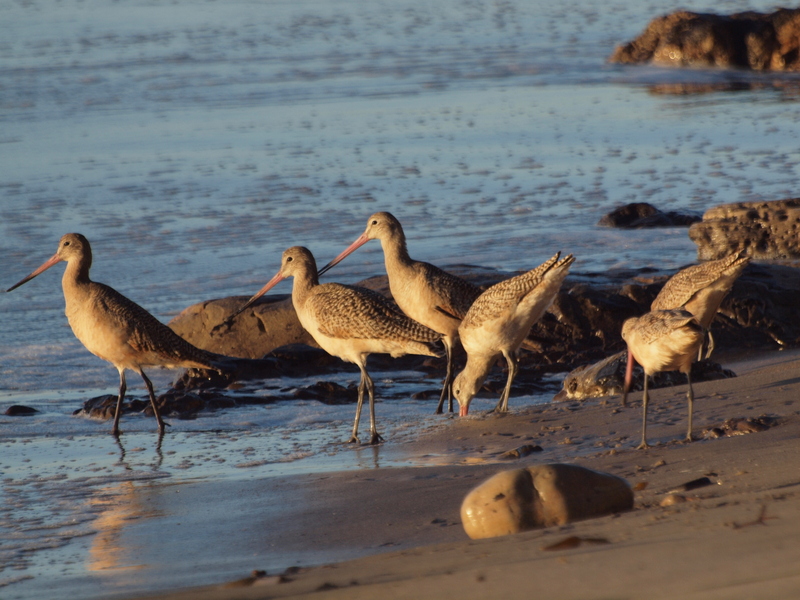 They migrate, making it likely their food varies by location. There are a lot of other interesting things they do, at the nest and away. But I’ll leave those for another time. For now, I’ll just remember the Texas eagle chasing a duck and the Missouri eagle high in a tree over the river. Buchanan, JB & Watson, JW 2010. Group hunting by immature bald eagles directed at gulls. Northwestern Naturalist 91:222-225. White, AF, Heath, JP, & Gisborne, B. 2006. Seasonal timing of bald eagle attendance and influence on activity budgets of glaucous-winged gulls in Barkley Sound, British Columbia. Waterbirds 29:497-500. Rice University students wrote many of these bird entries, including the top posts on red-shouldered hawks and starlings. Some had to revise them considerably before I felt comfortable posting them. Others seemed to be natural writers. Here are the instructions that generated these great entries. I plan to do more of this with our wonderful Washington University in St. Louis undergrads, once I figure out the birding scene. I found the FAQ format of the assignment to be very effective. There are three of these due at 11:55 PM, 7 February, 23 March, and 6 April, to be turned in through Owlspace Assignments. Turn them in early since we can’t take late assignments. Save your work! Computers break, hard drives fail, flash drives get run through the washing machine. Use Dropbox, or an online back up, but do it wisely, or the ether can gobble your stuff up! Of course, if you are not very busy right now, you can simply turn in all three assignments way early, and just enjoy the rest of the course. All are now open on Owlspace. Also, at the same place turn in the PDFs of the papers you used for your report. Each is worth 15 points. What is refereed scientific literature? Refereed scientific literature is published in journals like Animal Behaviour, Behavioral Ecology, Behavioral Ecology and Sociobiology, Evolution, Ecology, Auk, Wilson Bulletin, Science, Nature, and Waterbirds and can be accessed through Web of Science, http://apps.isiknowledge.com/WOS_GeneralSearch_input.do?product=WOS&search_mode=GeneralSearch&SID=2CD28PDbNIni5EG2Dgj&preferencesSaved=/ , or Google Scholar, http://scholar.google.com/ . Note that you can only use Web of Science from on campus. Look at Wikipedia or Cornell’s Birds of North America AFTER, not before you have done your assignment. They are like blinders that keep you from seeing the cool stuff in the original literature. If you know more about your bird than Wikipedia has, become a contributor and update the Wikipedia site. What should I search for to find cool stuff about my bird? You’ll get a lot more stuff if you search for the scientific name, and not the common name. I searched for Zonotrichia albicollis and got a more than when I searched for white-throated sparrow. What should go in the observation section? Watch the bird or birds for at least 10 minutes. A couple of hours would be better, but we won’t necessarily have time for that on the field trips, so watch less time if that is your only opportunity to watch. We encourage you to hang back from the group and watch your bird. Just be sure you can catch up. Call me on my cell if you get lost (832-978-5961). Write down everything the bird is doing. Where does it go? What makes it move? Does it interact with other birds? What is it eating? Is it easily spooked? Is it singing or calling? What makes it start and stop? Where does it call from? What is the general environment around it? If you see your birds on more than one occasion what connects them? What do you think about it? Make it personal and engaging. If you have already read some of the scientific literature, it will help your observations. What should go in the literature section? This is the main part of the blog. Here you have learned something cool about your bird, and you share it in an engaging and scientifically accurate way, written for the non-scientist general public. Be sure your paragraphs are in a nice order, and you have transitions between them. Sure fire topics are things like mating behavior, parental care, migratory behavior, conservation issues, territoriality, songs, social behavior, foraging behavior, interesting physical traits. This is not a boring catalogue, but a selective discussion of interesting things put in context. 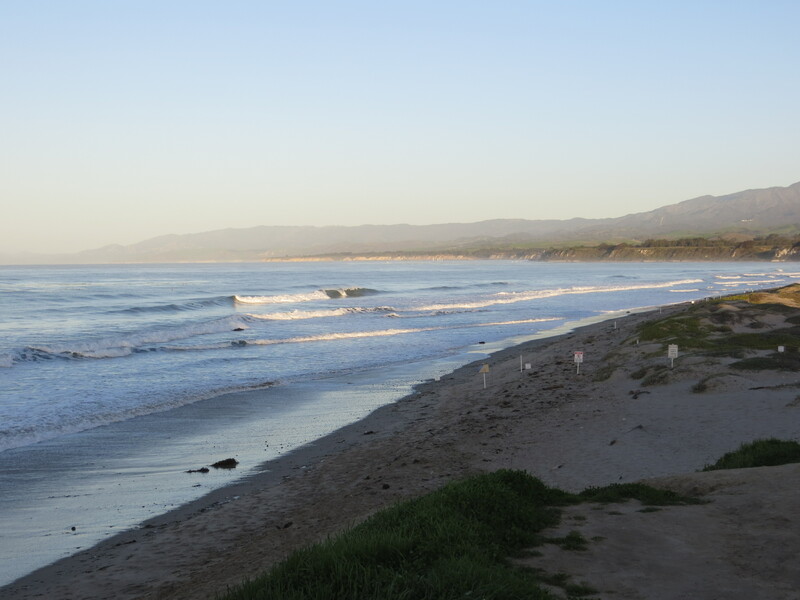 You can also talk some about the researchers and the field site. I always like to have some numbers, not just generalizations. Mention the year of the study, where it took place, and give some key numbers. Be sure to put the scientific name of the bird somewhere in there. Look at the example! What should the title be? Blogs live or die by their titles, tags, and links. So the title should be fun. 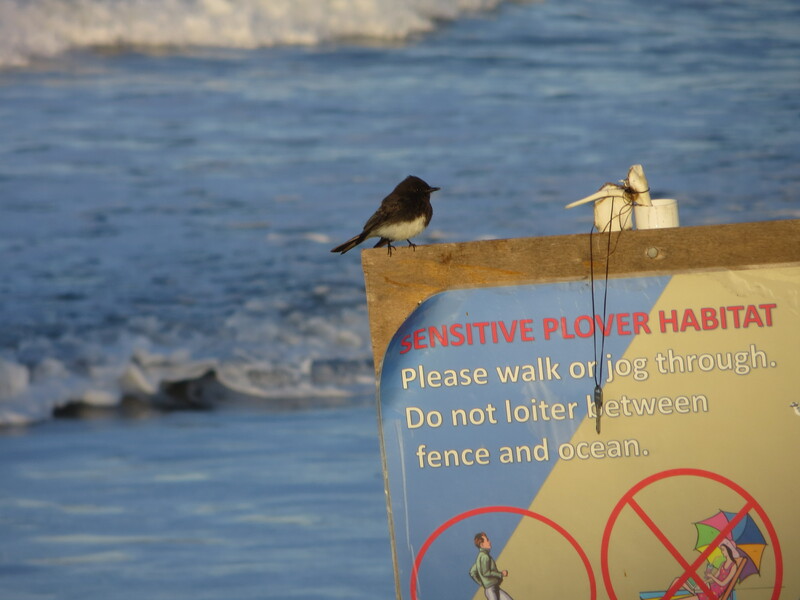 It must include the common name of the bird. Capitalize only the first word of the blog. Bird names are not capitalized. What kinds of figures do I need? Figures make a story come alive. They should illustrate the key points of your piece. You should have a couple of photographs of the bird. Habitat photographs are also good. Capture at least 2 graphs from the primary literature and put them in your blog. Take no more than one graph from any one article, and this should be all right under fair use rules. The photographs must be from open sources if you don’t take them yourself. Check under Wikimedia. Where should the figures go? The figures should go at the end, after the references. Each one should have a clear caption that says what it shows, and where it came from. The reason we don’t put them into the text is that some browsers don’t handle that very well, and make things harder to read. What should I link to? Links make your blog part of the community. Link to the web pages of the researchers you are studying. Link to the field site where their work takes place. Link to the journals you used to do your research. Link to important things you find. What should go in the references section? Use at least 5 refereed references. Because this is a blog, we aren’t putting references in the text, just at the end. They should follow the form at the end of the paragraph. They should be linked to the actual article, or the PubMed or Google Scholar version. Be sure to include the universal locator, the doi. Annotate the bibliography by putting a comment after it, as in this example. Use exactly this format for the references. This paper explains the different places the two morphs nest, and discusses the significance of having two strategies. How can I get more insight into my bird? Go to the web pages of some of the authors. They may well have some nice explanations, and might have photographs they would let you use. Just be sure to do this AFTER you have read the primary literature, and do not copy content or structure of any work found here. Can I have a friend read over my rough draft? Absolutely, yes! This is crucial. You can trade with others in the class and read each other’s. We will not post inferior blogs on the website, but you can fix them up for posting. Try to get as many people as possible to read and comment on your entry before you turn it in. How many times will I have to revise? If you want your entry posted on the Slowbirding site, you will have to revise it until I am happy with it. It could be once or 20 times. I will read and reread as often as necessary. Just try to pay careful attention to my comments each time. We want your entries to be fun, to be read by birders that only count, haven’t learned to watch. Is there an example of this unusual assignment that I can follow? I have posted an example on white-throated sparrows at http://goodbyehouston.wordpress.com/ and will post others. Any bird I do is subsequently off limits. When do I pick my birds? Now! If you tell me what bird(s) you will do I will put your name down, and I will not do them. You can reserve all three birds now, or wait until the field trips. If you reserve them, be sure they are common enough that we are guaranteed to see them. You have the list for the first trip and should email me now with your choice, as several of you already have. Only 2 people can do the same bird. Did you wonder what David Sibley does when he isn’t out birding, isn’t painting those wonderful illustrations, isn’t home with his wife and two sons? Well, a few weeks ago on a Thursday night David Sibley spoke at the zoo in St. Louis about Audubon, Peterson, and the point of field guides. When David was becoming the birder he is, he told us he never understood Audubon’s paintings. He inadvertently painted for us a vivid picture of the young high school David Sibley, shunned by his peers for his odd interests, studying birds, bird guides, and running around everywhere in pursuit of the best birds. What did his father, an ornithologist at Yale, think of his amateur son? In a way you could say that David Sibley brought feminism to birding by treating females front and center, closely followed by immatures. Perhaps the pages most turned to in any bird field guide are those of the warblers. When people speak of the jewels in the trees that scatter in the spring forest at High Island, or Point Pelee, they usually think of the brilliant male blackburnian warbler, or the Wilson’s warbler, or even a flashy American redstart. But birds exist at other times than the spring migration. Birds exist in other forms than the mature male. What about the females? What about the juveniles? What do they look like? What do they do? Sibley nearly forces us to pay attention, for that all-important warbler summary, on page 424 and 425 in my big book, covers first-year winter females with nary a male in sight. I want to know about the females, about the juveniles, even about the males. What are the proportions of each? Is the population growing? Are the young migrating well? Do they do so at the same time as their parents? In what species do the males come north to establish their territories before the females? I want to understand birds, and males alone, however flashy, are only part of the story. But David Sibley did not talk about his brilliant field guides at this meeting, though he did sign them. He did not rail about the inadequacy of most field guides, or about how poorly they treated females. Instead he uncomfortably acted like the public figure he is. He showed us some Audubon paintings that seemed so unnatural to him, for their contorted poses, their crowding. One was the Carolina parakeets, now extinct. And then David shared with us how he finally understood Audubon. He understood the paintings not as scenes from nature, but as compilations of different things the birds might do, in poses as startlingly natural for his time as David’s own females are for our time. And so he learned to appreciate the naturalness of Audubon. When David Sibley began talking about Roger Tory Peterson, he lost his voice. Pauses were more frequent than sentences. I can’t remember what he actually choked out about Peterson, but it did not excite, so I let my imagination fill in. David Sibley was probably born in 1962 (Wikipedia) or 1961 (front page of his book). This means he certainly began birding in childhood with a copy of Peterson’s A field guide to the birds in his hands, or jammed into the back of his pants. He must have loved the book; he must still love it, even as he grew increasingly frustrated with it. Let’s look at those warblers as Peterson tells about them. I have two of his books in front of me, both eastern United States. One is copyrighted in 1947, the second edition, but must have been obtained by me and my husband separately in the 1960s. The other book I have is copyright 2002, the fourth edition from 1980. In the earlier book females are tucked demurely behind their males when they are shown at all. For quite a few, females are not shown, but there is a note that says “see text.” This was not so easily done in this early edition where the plates and the text were separate. The tucked-behind females show their heads, throats, even part of the belly and tail, but wings, wing bars, much of the body is obscured. Peterson is discouraging in other ways. Autumn warblers are on a different set of pages entitled Confusing Fall Warblers. Who would even try, given that heading? Wouldn’t you rather be told that face markings can often define a bird, though they may be more subtle in some? Of course we really know the bird from its behavior, whether it flits low and spreads its tail, or pokes at the bundles of dead leaves, or preens in the highest branches. But Peterson is what we had. Peterson has those copyrighted lines that point to characters important for species identification. In the modern Peterson the females have stepped nearly entirely forward, out of their male’s shadow, though the tail tip is usually still hidden behind him. Even in today’s edition, fall warblers are still confusing. Sibley’s talk was one of three in the 2011 Whitney and Anna Harris Conservation Forum, entitled Giants in the American Conservation Movement. The other two eloquent speakers were Susan Flader who spoke on Aldo Leopold, and Maril Hazlett, who spoke on Rachel Carson. I want to learn more about my new home state, and so will be buying Susan Flader’s book, Thinking like a mountain, on Aldo Leopold. I realized I already have another book she edited, The river of the mother of god, and other essays by Aldo Leopold. I got it down from the high shelf, and will read it again. I fear that for many, getting David Sibley to sign their field guide was a major draw of the evening. He sat at the table, signing books before he spoke, after he spoke. I wonder if he ever got to grab one of those rubbery veggie wraps, or white-bread turkey sandwiches we got? I brought a couple of our Sibley field guides and we cruised around before the event, then stood in line because we saw no one we knew. We got no signatures, however, because the line closed for the talk before we reached the head. Afterwards, we found friends, and so chatted instead. Why get your book signed? To show you were there? To get a shiver of connection? To increase its value? I know authors have to sign books, but I bet David Sibley would have liked to tell us to take the book and get outside, for that is what they are for, a key to nature, best outside. Maril Hazlett, Susan Flader, David Sibley, taking questions after their talks. I’ve never really understood the fear of large black birds that many people report. I’ve been told by those more well-read on the subject of human psychology that we are instinctively afraid of such creatures, archetypes of doom. Something must be wrong with my instincts then, because I find the American crow (Corvus Brachyrhynchos) in particular to be absolutely fascinating and in no way frightening. Perhaps this is in part because I learned about this species’ extreme intelligence before I ever heard about Alfred Hitchcock’s The Birds (1963) or any mutterings by Edgar Allen Poe. American crows have been observed to display ingenious tool use – a sign of great intelligence within the animal kingdom – for numerous reasons, including foraging, nest defense, and even play (Caffrey 2001). American crows have been observed to not only use sticks for poking into the holely homes of potential arthropod snacks, but to modify the sticks for better fit. Caffrey (2000) directly observed an American crow doing just that in an attempt to grab a spider lunch from a hole in a wooden fence post. The crow, finding its own beak was too big to fit into the hole, broke off a small piece of the fence, shaped the piece by pecking at it with its beak, and then used this now narrow piece to prod for the spider. The fact that the crow used an external tool to forage is an obvious sign of intelligence and ingenuity. However, a less obvious but possibly even more significant proof of intelligence in this story is that the crow realized that the piece it broke off was slightly too big to fit the hole before attempting the probe; the crow had remembered the general size of the hole, knew the piece of wood was larger, and had applied this knowledge by shaping the piece for successful use. American crows living in close proximity to human development have found a way to use our tools as well, although for different functions and in different fashion. 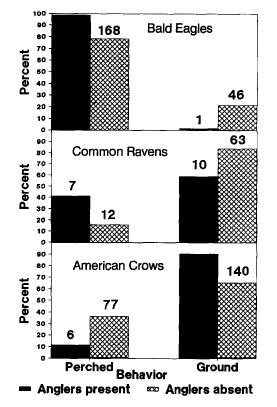 Grobecker and Pietsch (1978) first reported the use of automobiles by crows as a means for more efficient foraging. (No, they don’t drive to the store.) Crows were found to drop palm fruit from a power line onto the street below for cars to run over and crack open. One might question the validity of this observation. Are we sure that the crows are purposefully using the cars as nutcrackers, or are they just very clumsy while sitting on power lines? It almost certainly is the former, as confirmed by the observation that the crows would not go down to inspect the fruit until a car had passed, sometimes waiting up to 7 minutes if the fruit had not cracked on impact with the pavement and had to wait for a car to deal the fatal blow (Grobecker and Pietsch 1978). American crows in other areas of the country have also been found to exhibit this behavior with walnuts and pecans (Caffrey 2001). 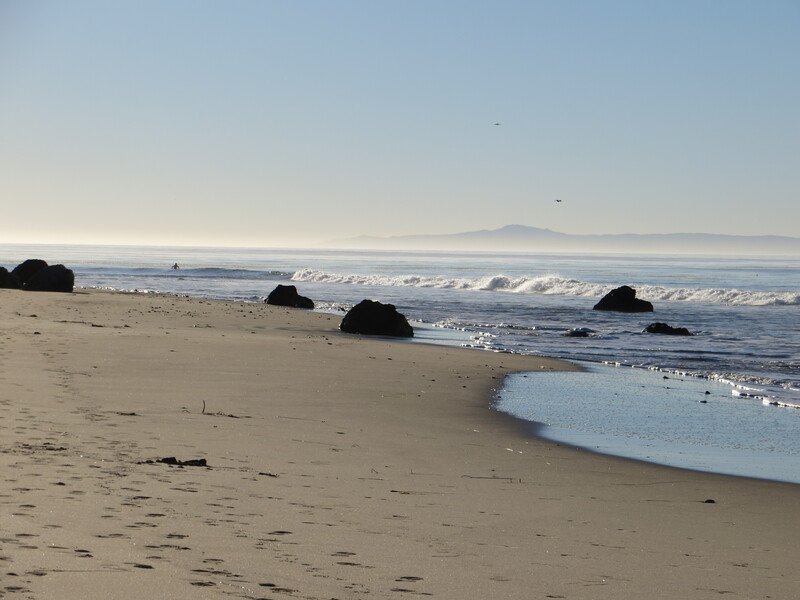 In a later study by Knight (1991), a comparison was made between American crows, bald eagles (Haliaetus leucocephalus), and common ravens (Corvus corax) that were anglers off the coast of Washington state. 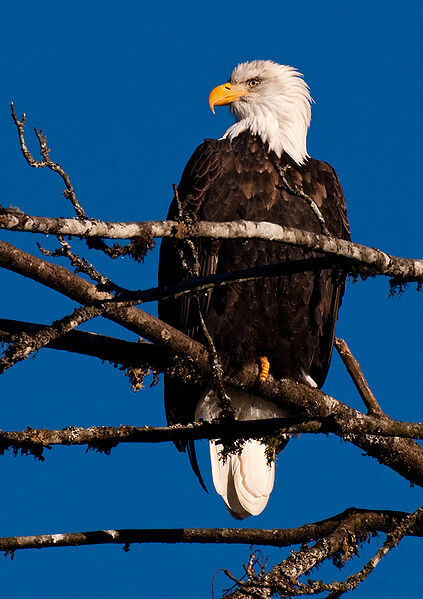 Knight found that both the bald eagles and the common ravens showed a stronger preference for perching – as opposed to foraging on the ground – while anglers were present, which doesn’t seem very surprising. What is interesting, however, is that the American crows were actually more likely to be on the ground with anglers present than without. Knight (1991) found that both bald eagles and ravens shifted their diurnal eating patterns on the days that anglers were present, yet crows continued to forage throughout the day, “thereby depleting the food at the expense of eagles and ravens.” Perhaps the crows had adapted more quickly to the anglers, just as they had to the less-persecuting urban humans, and found a unique window of opportunity for less foraging competition during the angler’s visits. I recently found myself lucky enough to observe a group (aka “murder”) of American crows first hand near my house. A small group of four crows were foraging in the grass just off the main road, seemingly oblivious to the cars rushing by. I think instead that they had adapted to the sight and sounds of the large metal beasts and knew that it was a very rare occasion that these strange creatures would venture off their hard grey path. The crows had little to fear here. I unfortunately did not observe any tool use that day, but nonetheless found the behavior of the birds to reveal their intelligence. The birds walked slowly at times, looking in the grass with beady eyes that belied their no doubt complex cortexes. They appeared to examine the ground carefully, rather than just pecking incessantly like some of their less intelligent feathered relatives. While I find its label as a portent of doom to be dubious at best, there should be no doubt as to the intelligence of the American crow. Recent studies have all but confirmed many ornithologists’ beliefs that the crow represents “the most advanced stage of avian evolution” (Powell 1976). Perhaps we should consider changing the name for a group of crows from a “murder” to a “mensa.” I for one find it far more appropriate. For anyone interested in learning more about the American crow, I recommend watching PBS Nature’s 50 minute episode on recent research into the intelligence of crows, entitled A Murder of Crows. The full episode can be found here. This paper is an observational look at a group of American crows in Encino, CA that drop nuts onto streets for passing cars to crack, as well as the use of pine cones as tools for nest-defense in a breeding pair in Stillwater, OK. Also noted in Encino, CA is the use of flower petals (tools) for play. This paper is an observational look at an American crow in Stillwater, OK displaying tool use and modification to reach inside a hole on a fence post containing a spider. Grobecker, D. B. and Pietsch, T. W. 1978. Crows use automobiles as nutcrackers. The Auk 95(4): 760-761. This paper is an observational look at a group of crows in Long Beach, CA that drop palm fruit onto the street below and only go to retrieve pieces of the fruit after cars have passed, assumingly breaking apart the fruit. Knight, R. L., Grout, D. J., and Temple, S. A. 1987. 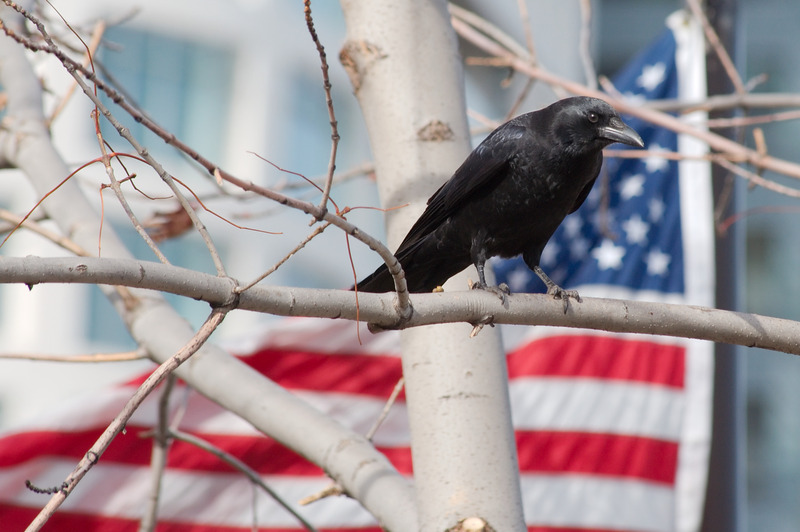 Nest-defense behavior of the American crow in urban and rural areas. The Condor 89(1): 175-177. This study compares the nest defense behaviors of American crows living in rural areas, where they are highly persecuted, with those crows living in urban areas, where they are not persecuted. The study finds that urban crows are far less defensive as a result. This study compares the scavenging behavior of a group of bald eagles, common ravens, and American crows off the coast of Washington with and without the presence of anglers. The study finds that American crows are less affected by the presence of anglers and may even be more willing to forage on the ground in their presence, giving them a foraging advantage over the other studied species. Powell, R. W. and Kelley, W. 1976. Responding under positive and negative response contingencies in pigeons and crows. Journal of the Experimental Analysis of Behavior 25(2): 219-225. doi: 10.1901/jeab.1976.25-219. This study uses both American crows and pigeons in a psychological experiment examining positive and negative response contingencies. The crows were find to be highly adaptable to negative contingencies and quick to learn. taken by Dori in Milwaukee, Wisconsin (public domain). 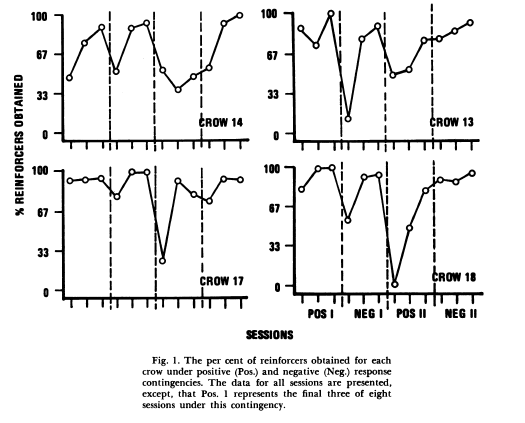 The graphs above from Powell (1976) show the results for the four American crows (Corvus Brachyrhynchos) used in their response-key experiment to determine the effect of negative response contingencies and negative automaintenance. The crows showed remarkable success in obtaining reinforcers and adaptive learning. The graph above from Knight (1991) compares the behavior of three bird species in the presence of anglers on the coast of Washington. While both bald eagles (Haliaetus leucocephalus) and common ravens (Corvus corax) showed a stronger preference for perching while anglers were present, American crows (Corvus Brachyrhynchos) were actually more likely to be on the ground with anglers present than without – an example of adaptability to human interaction.